"This recipe is over 27 years old. It is a classic dish and a tasty treat for your guests and you to enjoy." Rub chicken pieces with garlic powder, salt and pepper. In a small bowl, beat egg yolk with honey and butter or margarine, then brush this mixture over chicken pieces. 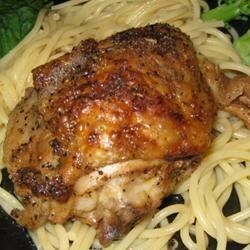 Place chicken pieces, skin side down, in a lightly greased 9x13 inch baking dish. Bake at 325 degrees F (165 degrees C) for 45 to 60 minutes or until chicken is cooked through and juices run clear, basting with remaining butter or margarine. Just before serving, turn chicken over and bake for another 10 to 15 minutes to cook the skin on the other side. Wouldn't name this honey baked chicken. Didn't taste the honey & I added more. Kinda bland. I'll use the leftovers for something else. Very good recipe. Burgers hold together better than many I've tried. I substituted packaged cornflake crumbs which also worked fine.